We wanted to see a lot of places, and this cruise fit the bill. I booked many tours through Viator and CIty Wonders because the outfits guaranteed to get us to the next port if we did not return in time. We paid less money than booking Norwegian excursions and got to experience more things, based on talking with other people when back onboard ship. 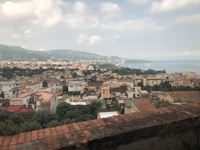 We also booked a driver for the day to see the Amalfi Coast. It was a splurge at 450 euros. But, our driver, Antonio, tailored the day to our interests: seeing the Amalfi Coast towns, stopping at scenic points for photos, shopping the market in Sorrento (where limoncello and olive is made), eating at Ristorante Zio Sam where food is grown across the street and served on a covered terrace overlooking Salerno Bay, and an hour stop at Pompei. In contrast, people on the ship&apos;s bus tour couldn&apos;t get as far up the coast as we did and ate at a "whack" pizza shop. (amalficoasttours.com) Before our cruise, we spent three days in Rome. Since we stayed close to the Vatican, we took a taxi to St. Peter&apos;s Train Station -- a straight shot to Civitachecci, rather than backtrack to Termini Station. The train ride was about an hour. When we arrived, we bought public bus tickets at the station&apos;s restaurant to get to the port shuttle bus. We arrived just as the embarkation process started; it was smooth, and we were on the ship in less than 10 minutes. For the ports, our first stop was Florence. We booked with Viator for a driver to take us directly to the town center, a 1.5-hour ride. I bought timed tickets beforehand for Michaelangelo&apos;s David statue in the Accademia. (We didn&apos;t do the Duomo steps but tickets are needed for them also.) I got a stunning piece of Murano glass for a necklace for 2,5 euros and my daughters got cashmere wraps for a song at sidestreet markets. My husband and I skipped Cannes because of Rick Steve&apos;s assessment of the town. We didn&apos;t book with a Viator tour in time to see Nice and couldn&apos;t take a train there because of a rail workers&apos; strike. However, our girls took a ship tender to shore and walked around Cannes because they wanted to be in France. They wanted to buy chocolate and were stunned that 1 kg cost 92 euros! For Barcelona, we walked Las Rambala and then took a bus to Sagrada Familia. We ordered tickets ahead of time to go up in the Tower of Passion. Don&apos;t plan on buying tickets on site. You won&apos;t get into a tower and will waste a lot of time waiting in line. The cathedral was spectacular with all kinds of art depicting nature, designed by Gaudi. In Majorca, we took a taxi to Port de Pollenca Beach, a beautiful public beach where you can rent chairs and have bathrooms. It&apos;s clean and surrounded by a town where you can walk to get food. It was beautiful and worth the drive. Overall, we got a taste of the ports and enjoyed our time on the ship. Eating outside on the deck was wonderful. We booked several dining room meals at The Manhattan Room and Taste, included in our fare. We got three booking perks and chose unlimited drinks, which was fine for us. You do pay extra for cappuccinos. Skip the Wi-Fi. It is SLOW, and only one person in a cabin can have it. I got kicked offline in the internet cafe using my husband&apos;s sign in; I was waiting to print something for 9 minutes. We went to the Wi-Fi desk and had lost minutes restored. Overall, service and hygiene were top notch. For disembarkation, we rolled our suitcases off the ship ourselves in just a few minutes. For our first cruise, we enjoyed our time on the Epic. We wanted to see a lot of places, and this cruise fit the bill. I booked many tours through Viator and CIty Wonders because the outfits guaranteed to get us to the next port if we did not return in time. We paid less money than booking Norwegian excursions and got to experience more things, based on talking with other people when back onboard ship. Before our cruise, we spent three days in Rome. Since we stayed close to the Vatican, we took a taxi to St. Peter&apos;s Train Station -- a straight shot to Civitachecci, rather than backtrack to Termini Station. The train ride was about an hour. When we arrived, we bought public bus tickets at the station&apos;s restaurant to get to the port shuttle bus. We arrived just as the embarkation process started; it was smooth, and we were on the ship in less than 10 minutes. For the ports, our first stop was Florence. We booked with Viator for a driver to take us directly to the town center, a 1.5-hour ride. I bought timed tickets beforehand for Michaelangelo&apos;s David statue in the Accademia. (We didn&apos;t do the Duomo steps but tickets are needed for them also.) I got a stunning piece of Murano glass for a necklace for 2,5 euros and my daughters got cashmere wraps for a song at sidestreet markets. My husband and I skipped Cannes because of Rick Steve&apos;s assessment of the town. We didn&apos;t book with a Viator tour in time to see Nice and couldn&apos;t take a train there because of a rail workers&apos; strike. However, our girls took a ship tender to shore and walked around Cannes because they wanted to be in France. They wanted to buy chocolate and were stunned that 1 kg cost 92 euros! For Barcelona, we walked Las Rambala and then took a bus to Sagrada Familia. We ordered tickets ahead of time to go up in the Tower of Passion. Don&apos;t plan on buying tickets on site. You won&apos;t get into a tower and will waste a lot of time waiting in line. The cathedral was spectacular with all kinds of art depicting nature, designed by Gaudi. In Majorca, we took a taxi to Port de Pollenca Beach, a beautiful public beach where you can rent chairs and have bathrooms. It&apos;s clean and surrounded by a town where you can walk to get food. It was beautiful and worth the drive. Overall, we got a taste of the ports and enjoyed our time on the ship. Eating outside on the deck was wonderful. We booked several dining room meals at The Manhattan Room and Taste, included in our fare. We got three booking perks and chose unlimited drinks, which was fine for us. You do pay extra for cappuccinos. Skip the Wi-Fi. It is SLOW, and only one person in a cabin can have it. I got kicked offline in the internet cafe using my husband&apos;s sign in; I was waiting to print something for 9 minutes. We went to the Wi-Fi desk and had lost minutes restored. Overall, service and hygiene were top notch. For disembarkation, we rolled our suitcases off the ship ourselves in just a few minutes. For our first cruise, we enjoyed our time on the Epic. Our cabin was lovely and we had enough room for two people to feel like we weren&apos;t stepping on each other. However, our daughters were in Cabin 13077, a smaller cabin. They were glad our son (who is 6&apos;5") did not come and share the room. They said it would have been a difficult fit for three. Also, my daughter was allergic to something in her room. The carpet had just been cleaned before they came to stay in the room for a week. She wondered if she was allergic to the detergent used to wash the sheets. She had pinpoint hives and watery eyes all week. Took the Livorno excursion to get to Florence quickly, a 1.5-hour drive. We met our driver quickly, hopped in the Mercedes van and made the most of 5.5 hours in Florence.